A young girl's wish is granted when a new sister arrives. While the baby can't do much, over time the big and little siblings become inseparable, playing and dancing, imagining and laughing. By each other's sides, they are smarter, kinder, and braver than they ever thought they could be. And they are forever sisters first. Jenna Bush Hager is a correspondent on NBC's Today Show and an editor-at-large for Southern Living magazine. She is the author of the New York Times bestseller Ana's Story: A Journey of Hope, and she co-authored the #1 New York Times bestseller Sisters First: Stories from Our Wild and Wonderful Life with her twin sister, as well as the children's books Our Great Big Backyard and Read All About It! with her mother, former First Lady Laura Bush. Jenna lives in New York. Barbara Pierce Bush is the CEO and co-founder of Global Health Corps, an organization that has mobilized almost one-thousand young leaders who believe health is a human right, and who take an innovative approach to solving some of the world's biggest global health challenges. 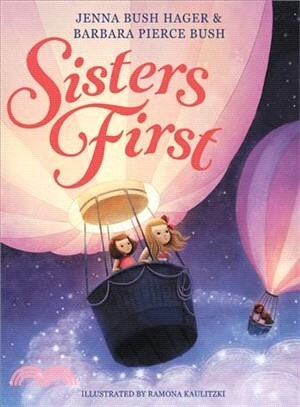 She is the co-author of the #1 New York Times bestseller Sisters First: Stories from Our Wild and Wonderful Life with her twin sister, and the picture book Sisters First is her debut work for children. Barbara lives in New York. Ramona Kaulitzki's biggest passions have always been drawing and storytelling. She enjoys creating characters and breathing life into them while imagining the worlds in which they live, and her love of animals and nature is a major inspiration for her work. You can visit her online at ramonakaulitzkiart.com.